Inbox Zero. It is possible! 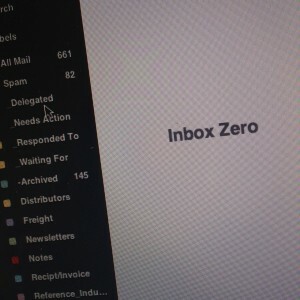 I used to scoff at the notion of achieving Inbox Zero. I thought that was only for extreme type A personalities that are also obsessive compulsive. But what I didn’t realize at the time was that having a clean Inbox isn’t just about keeping things tidy, it’s about being productive and getting more things done in a more efficient manner. First of all I would like to clear up a misunderstanding about Inbox Zero that I think a lot of people have. I know it was one I had. Inbox Zero doesn’t mean you have checked and read every single email. It means that you have screened every email that has come in and moved it over to a designated folder that will allow you to attend to the email at the appropriate time. 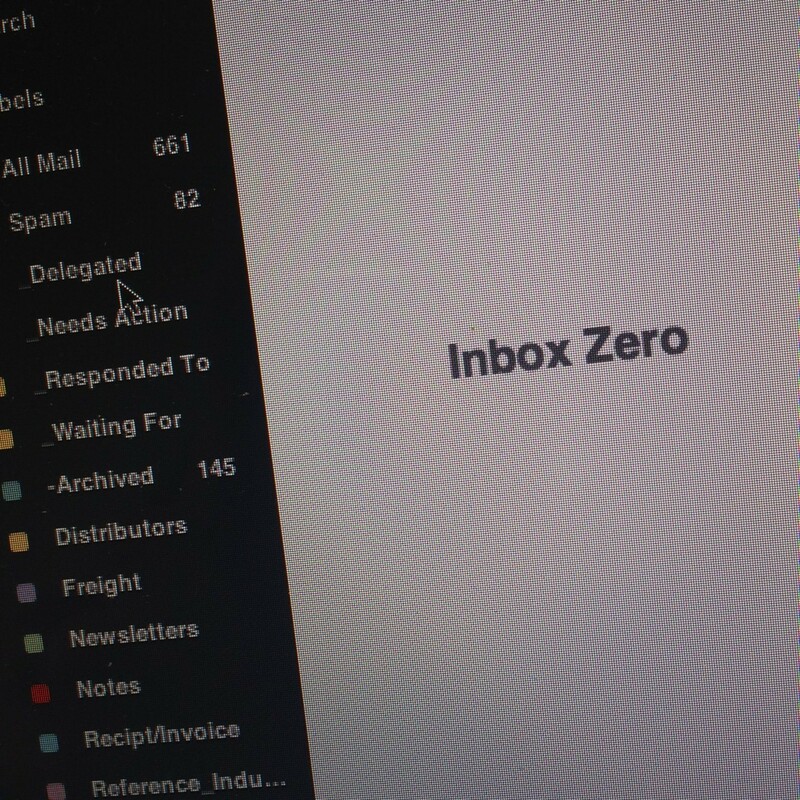 Essentially, Inbox Zero is mastering control and organization over your Inbox. I used to sit down at my email and scroll through old emails in fear that I have missed something. This is what essentially pushed me towards email management. Being at a constant state of Inbox Zero essentially lets you control your email, rather than your email controlling you. First of all, you need to have at least five folders or labels in your email system. I recommend the folders: Needs Attention, Delegated, Waiting for Reply, Reference, and Archived. These folders are essentially holding places for your emails and allow you stay on top of every project and process you currently have going on. Let me explain. You typically may sit down to answer email and start scrolling through your emails. The first one you read may require a bit more attention and require some research before answering, so you skip it and go to the next email. This one is a asking for a simple piece of information that will take you less than two minutes to reply to, so you immediately send off the reply. You also have several other miscellaneous emails such as newsletters, solicitations, and other emails that are not relevant to actual work. Several other emails may be items you can delegate to another team member, so you send the request their way and forget about it. The problem with this method of checking emails is that you are constantly getting more emails, and important emails often get lost (like the one you skipped over), and emails you may have delegated to somebody else never get followed up on. Email management allows you to have better control over your email and ultimately helps you get more stuff done. I mentioned five different folders earlier: below is how I utilize each folder. As emails come in I moved them to the appropriate folder, thus keeping the main Inbox uncluttered. At Inbox Zero and my other folders are essentially acting as a task/project management system. Needs Attention: Essentially any emails that I don’t respond to right away, or that requires a detailed response I move to this folder. These emails range from simple questions to request to complete complex tasks. Any email in this folder needs to be responded to or acted on. Now, lets say I responded to an email in this folder. My next action is to move it into another folder. If I’m expecting further follow up, I will move it to my “Waiting On” folder, if no further follow up is expected, I will have it to my Archived Folder. If it’s something I ended up delegating to another team member, it gets moved to the “Delegated Folder”. This is perhaps the most important folder to have. Having this folder helps me sleep better at night and work more productively through the day because I’m not wasting time hunting through my Inbox to make sure there was something I missed. Waiting For: The waiting for is the placeholder for emails that have been responded to and are likely to receive further feedback or correspondence, or emails that have been sent out and require a reply. Once the conversation related to that particular emails are over I will move the email to the Archived folder in case I need to reference it again at a later time. Delegated: This folder is use to place emails that have been delegated to other team members. I will CC myself when I forward on the delegated task, and then move the email over to the delegated folder. This way I know who is now responsible for the task and I remember to follow up with that person a few days later. Once I know the delegated task is complete I will transfer the email to the Archived folder. Reference: This is pretty much a catch all folder where I place newsletters, industry news, trade show solicitations, and other emails that I may want to read or look at later, but are just going to be time wastes at the time I’m checking email. Archived: The graveyard for all emails that have been responded to! The nice thing about moving your emails to an archived folder is that you can reference them later if you need to. Simply put, any emails that are no longer active conversations go here. You may find it helpful to have other folders as well in order for you to quickly access important information. I have a couple folders for some key accounts that we work with frequently, as well as one for invoices and receipts. The number of folders you will need to effectively manage your Inbox will depend on the nature of your work. The folders mentioned above are key to having effective email management. You should make your system tailored to your specific needs. Email management is a way to achieve a higher level of productivity and get more stuff done. During the first week I started truly managing my emails I couldn’t believe how well it was working. It was working so well I kept thinking there has to be something I’m missing, but there wasn’t. The more I use this system the more my mind feels free, which allows me to focus on other more important projects. Posted in Getting Things Done and tagged email, inbox, management, zero. Bookmark the permalink.